For ages 7 to 9, “Marine Animal Adaptations” will explore the relationships between structure and function in a variety of marine animals, including sharks, squid and a host of invertebrates observable only through microscopes. 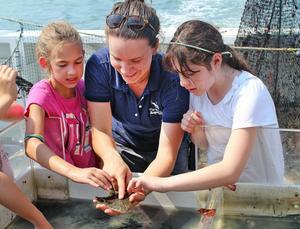 Students’ investigations into behavioral adaptations will include the cruise out on the Aquarium’s research vessel to consider the adaptations of animals found in Long Island Sound. Class size is limited to 15 students. For ages 10 to 13, the “Marine Biology” series will delve into such topics as marine biodiversity, water-quality monitoring, fish anatomy, conservation and more. Additionally, students will go behind the scenes of the Aquarium to learn about the diverse careers needed to operate a modern aquarium, and also will collect data about animals and water quality during the cruise out on the Sound. Class size is limited to 20 students. Cost of each series is $275 ($250 for Aquarium members). Deadline to register is Wed., Sept. 19. Get more details and sign up at www.maritimeaquarium.org/homeschool-students.